This area is out of bounds to Stratford pilots, and also to any other pilot with a modicum of common sense. This is an approach to BHX. Stratford rule is max 3000′ QFE. 3 Not controlledThis area is not under the control of BHX, although it’s not completely free because part of it has the airway, 5, above it. This is a BHX manoeuvring area. Stratford rule is max 2000′ QFE. 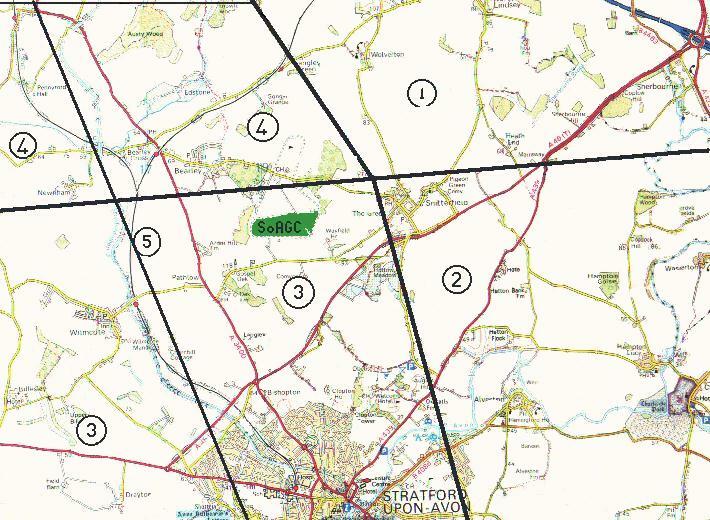 This region is known as Snitterfield Corner, and is subject to an agreement between BHX ATC and SOAGC, which gives extra rights to pilots who have launched from Snitterfield. All airspace to the East of this line is Amber One. If you want to fly over the top of the airway, you’re on your own.